Jim Stynes had achieved more than most of us dream in his 45 years; AFL consecutive games record holder, a Brownlow Medallist, youth leader, Victorian of the Year, OAM and Melbourne Football Club president. He was also a father to 2 children and husband to wife Sam, who is the true subject of this blog. How does a partner ‘move on’ when their loss feels like a freight train has irreverently rampaged its way through your heart, leaving a gaping void? How does a partner ‘move on’ when their loved one has risen to such dizzying heights of public adoration? I really have no idea, but I imagine that it is a moment at a time, an hour at a time, a day at a time; living in the enormous shadow that their loved one cast in life and now, in death. It has got to be one of the most challenging tasks this life presents, to keep on living and make sense of their new reality. It is a lonely and isolating journey that rarely needs or even welcomes the commentary of well-meaning family and friends. Grief only asks for the other to be present, to listen, to companion. I am sad that Sam felt she had to celebrate her engagement in secrecy. I am sad that Sam felt that she had to keep her marriage a secret. I am sad that she had to bear the pain of recrimination from friends and strangers. I ask myself, who made these rules about when it is okay to ‘move on’ anyway? Is there a book of indelible rules that no one has informed me about? Does Australia Post send me a copy of the rules in the event of the loss of a loved one? Or are these rules internalised in our psychic; informed by the society we live in, our parents & friends, media and teachers? When we internalise these rules, they largely lay in our unconscious self, un-critiqued until we are confronted by our own great loss. Suddenly those unspoken rules take on an authority wielding a power that can devastate the already fragile, vulnerable, grieving heart. When we observe our friend ‘not moving on’ we get anxious, perhaps frustrated or impatient with them. Perhaps ‘our’ rules inform us that it is not okay to leave their loved ones clothes hanging in the closet long after they are gone? We wonder how normal it is to continue to set a place at the table for dad months after he has died, or suspect there is something very wrong when a bereaved parent leaves their dead child’s room untouched long after they’re gone. Yes, it is confronting, but confronting for whom? May be there is no ‘normal,’ and your loved one is just trying to navigate their daily life and find a different way to maintain a connection with their loved one. On the other hand, when a person apparently does ‘move on’ (as it appears to be in Sam’s case), we feel offended – it is ‘to soon’, ‘on the rebound’, or ‘disrespectful to their loved one,’ are familiar phrases. Our internalised rules declare how inappropriate that person is behaving. Who made those rules? 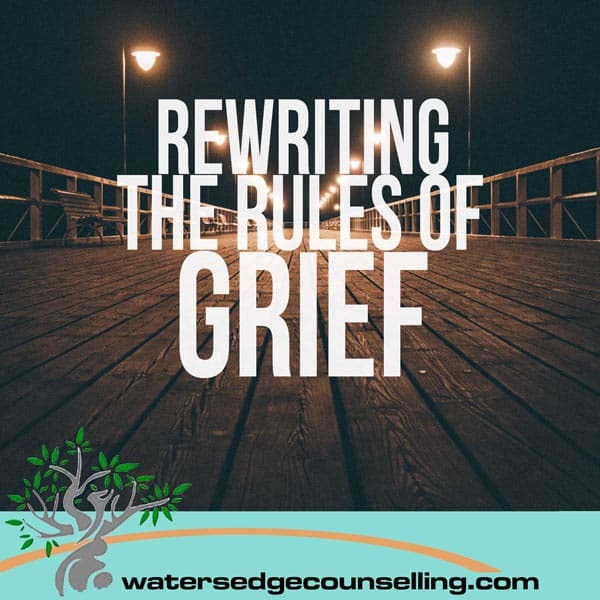 Why do we feel the need or believe we have the right to dictate the rules around grief when it isn’t even our journey? Recent research into how we grieve has moved quite profoundly from the old notion of doing ‘stages of grief’ (Elizabeth Kubler-Ross), to a more dynamic notion where the person who is grieving interacts with the loss experience. People move between their overwhelming loss and the new life they must attend to, oscillating between the two (M.S.Stoebe & Shut 1999). Their task is not so much to ‘let go’ or to ‘move on,’ as it is to work out a way to interact with their loved one even though they are physically absent. We can ‘move with’ rather than ‘moving on’ from grief and the relationship with the person we grieve (Klass, Silverman & Nickman 1996). After all, there is no right or wrong way to grieve – we just do the best we know how at the time, forging a different, but no less significant connection, with the deceased while at the same time, continuing the task of living and forming new attachments. That is what Sam Ludbey is doing, as we all must do when confronted by our own great loss. Didn’t see this article but I have observed similar things happening to other people. I think what a lot of people don’t realise is that when you love someone who is terminally ill, grief begins way before the person actually dies and that is why the person left ‘appears’ to move on quickly rather than having already grieved for quiet some time. Totally different to the situation where someone dies suddenly.